The Big Joe J1 Joey aerial lift is a unique alternative to a traditional scissor lift. With lift heights up to 16 feet, the J1 Joey aerial lift allows a single operator to reach heights with a very small footprint. The J1 Joey aerial lift is narrow enough to fit in a typical office setting and operates great in narrow or congested aisles. With a platform tray that can carry 500 pounds, single item picking has never been easier. The Big Joe J1 Joey aerial lift is an economical purchase in the present and future. At roughly half the cost of a traditional scissor lift, the J1 Joey has largely the same capability at a more economical price point. Reach heights up to 16 feet, at prices never seen before. All J1 Joey aerial lifts are simple to operate and safe. The J1 Joey aerial lift is the best alternative to a rolling ladder. A person manually stepping up and down a rolling ladder in a store or warehouse causes severe safety concerns, while the J1 Joey aerial lift safely lifts you to the required height. The J1 Joey aerial lift comes with (4) 6-volt maintenance free batteries for the 126″ and 162″ heights. With being maintenance free, there is no need to water the batteries or question of how to charge them. Simply plug the cord into the wall and you are charging! What application do I use the J1 Joey aerial lift in? The Big Joe J1 Joey aerial lift is a great option for overhead maintenance is required. 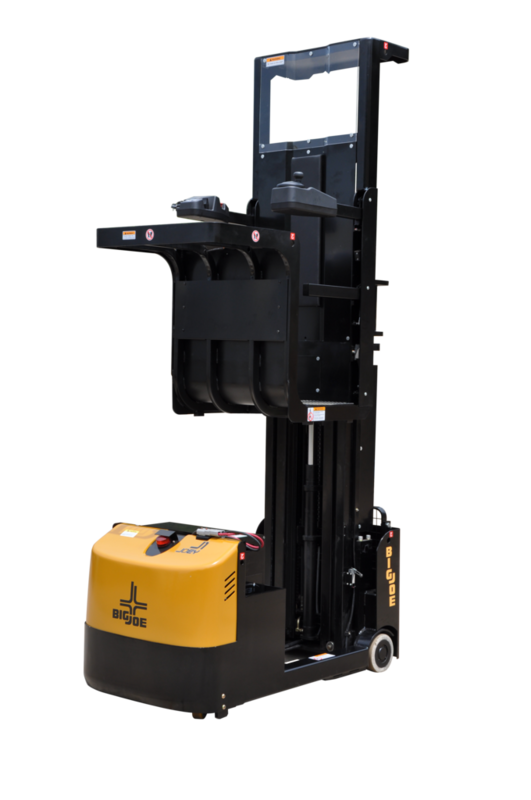 The J1 Joey aerial lift isn’t just for maintenance in a warehouse or manufacturing facility; this could be used in maintenance in an office building or a grocery store. Any type of application where high level light bulbs need to be changed, high level racks for single items needs to be reached, the J1 Joey aerial lift is the best option.